For over two decades, Zator Law has embraced our core values in providing professional services to clients in the Lehigh Valley and beyond. We are committed to using our team’s collective depth to analyze, understand, and anticipate each client’s goals and needs. Zator Law strives to deliver personal attention, exercising an impressive work ethic and efficiency that our clients value highly. We work to deliver creativity to each task with an entrepreneurial attitude. As legal advisors and trusted counselors, we seek to integrate common-sense, cost-effective ideas with inventive approaches, all in pursuit of solutions and opportunities for our clients. As an award-winning team, we are well respected for the integrity and dedication we apply each day, which engenders trust, loyalty, and long-term relationships. Our mission is to provide client-focused representation and professional services in ever-changing legal and business environments. We accomplish our mission by striving to internalize and practice the Firm’s guiding values and ideals of integrity, dedication, trust, excellence, reputation, teamwork, sense of urgency, creativity, loyalty, listening, cost effectiveness, citizenship, learning, enthusiasm, respect, and leadership. All of us at Zator Law appreciate the community in which we live and work—and we believe that community involvement must be a vital part of who we are as a team. 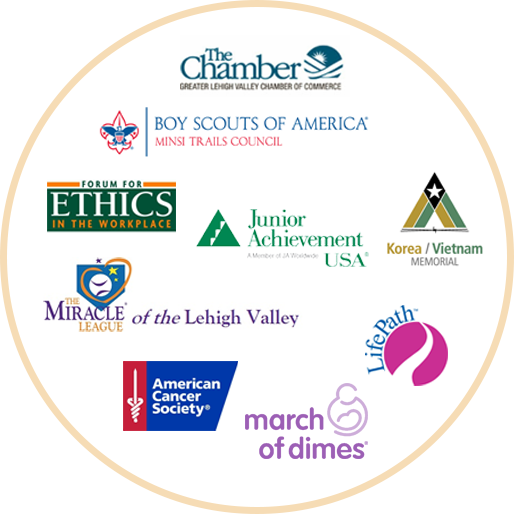 We fulfill this commitment through dedicating a combination of our time, talent, and resources to non-profit and neighborhood organizations throughout the Lehigh Valley as well as other regions. In turn, such assistance to others enriches us as a Firm and as individuals.